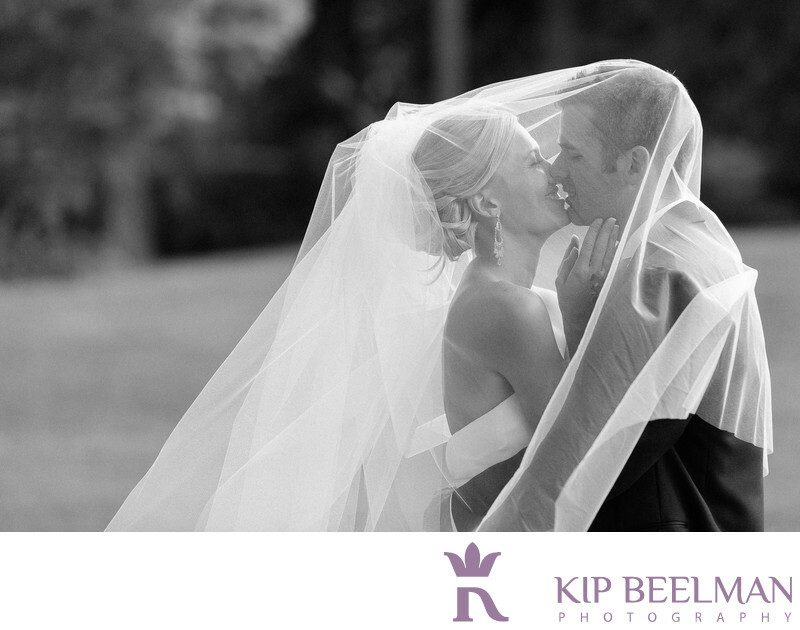 The bride’s lovely long veil made for a lovely long kiss in this Hotel Bellevue at Bellevue Club wedding photography. On a beautiful night to get married in downtown Bellevue, Washington, this image was created with my 70-200mm lens when I asked the couple if they could just be silly for a few moments. It captures the bride’s beautiful veil, dress, jewelry and hair as well as an even more beautiful embrace between the bride and groom. A luxury hotel and fantastic destination for wedding photography, the Hotel Bellevue at Bellevue Club bridal suite offered a gorgeous setting with incredible light to get ready and to begin the day’s wedding photography. We later took an enjoyable photo walk around town to capture a series of portraits at the downtown Bellevue Park and surrounding areas, including the Bellevue Art Museum and Westin. We brought in classic and modern, color and black and white, silly and serious in these wedding portraits. The heart of beautiful downtown Bellevue is nestled between the Cascade Mountains and Puget Sound, creating majestic views for as far as the eye can see – but you don’t have to look very far to see a blissful sight right here. The award-winning Hotel Bellevue at Bellevue Club’s Olympic Ballroom also offers a lovely garden for wedding ceremonies, dramatic colors and design, an atrium with skylights and a baby grand piano, wonderful reception space, a sense of grace, and a setting very deserving of this happy bride and groom. Location: 11200 SE 6th St, Bellevue, WA 98004. Keywords: Bellevue (3), Bellevue Club (3), Hotel Wedding (48).